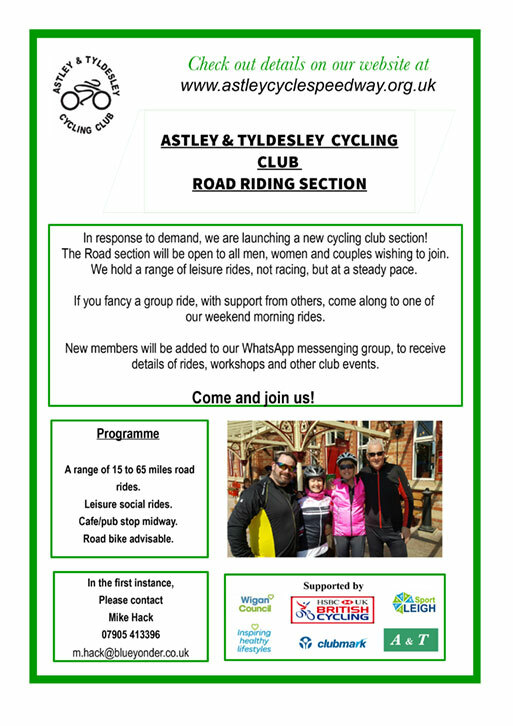 In response to demand at the beginning of 2017, Astley & Tyldesley Cycling Club launched a new Road section. The section is open to all adults. Riders will normally meet in the Bull's Head car park, Manchester Road, Astley, where a range of 15 to 65 mile rides will begin, with a coffee stop midway. If you wish to join the Road Section, please notify Mike Hack of your mobile number, so you can be added to the group's WhatsApp messaging group. In the event of bad weather the ride leader taking the session will decide if the event should run or not. Members of the Road Section will be notified of any cancellation by WhatsApp messaging.